1. The General Terms and Conditions (hereinafter referred to as the "Terms") govern the rights and obligations related to the purchase of goods in the online store www.herbamedicus.com and are an integral part of the Purchase Contract concluded between the Seller (internet store operator) and the Buyer. By concluding the Purchase Contract the Buyer confirms he got acquainted with the Terms and agrees with them. 2. The Terms are executed in the English language and are valid as of 19 Sep 2016. E-shop - online store at www.herbamedicus.com. The Contracting Parties - the Seller and the Buyer. The Buyer - the Consumer or the Entrepreneur who concludes the Purchase Contract with the Seller through e-shop. The Consumer - any person who outside his entrepreneurial activity or outside the independent exercise of his profession concludes the contract with the Entrepreneur or deals with the Entrepreneur in other way. The Entrepreneur - a person who concludes a Purchase Contract with the Seller in connection with performance of his entrepreneurial activity, or within independent exercise of his profession, or a person acting on behalf of or for the Entrepreneur. The Purchase Contract - a contract concluded between the Seller and the Buyer through the e-shop with a subject to purchase the goods. The Goods - objects that the Seller offers for sale through the e-shop, with particular regard to dietary supplements, massage products and herbal balms, whose sale the Seller is authorized for. The Consumer Contract - a Purchase Contract, Contract for Work or other contracts, where the Consumer is one of the Contractual Parties and the Entrepreneur is the second one. Working Days - the days of the calendar week from Monday to Friday, except Saturdays, Sundays and days, which in accordance with the applicable legislation fall on public holidays. Civil Code - Law no. 89/2012 Coll., Civil Code. 1. Placing goods offered by the Seller on the e-shop Website is not considered to be a proposal to conclude a Purchase Contract (a bid) within the meaning of the provision of Art. 1732 par. 2 of the Civil Code and therefore any presentation of the goods placed on the e-shop is for information purposes only and the Seller is not obliged to conclude a Purchase Contract regarding these goods. 2. The Goods from the the e-shop are properly labelled with the name and are usually shown together with a verbal description containing information about the goods and their main characteristics, including the price of individual goods. 3. Once the Buyer selects the goods, including quantity and any other parameters if these items are optional, he places the goods in the shopping cart by clicking on the "add to cart" icon. In this way the goods are transferred to the "cart" and then shown to the Buyer after clicking on the "cart" icon. 4. The Buyer starts the process of order confirmation by clicking the "next step" link. For the order implementation the Buyer is required to register in order to create a user account, or to log into his existing user account (Art. XII of the Terms). The Buyer is also given the option to implement the order without registration. 5. Subsequently the Buyer provides his own details, delivery details including his e-mail address and phone number, if such information is not already stated in the order form after login to the user account, then the Buyer selects the mean of transport of the goods (Art. VI of the Terms) and the payment method for the goods (Art. V of the Terms), alternatively he adds order notes in a dedicated box. After order completion, the information stated in the order is considered by the Seller to be complete and correct and the Seller is not responsible for their incompleteness and/or inaccuracy..
6. In the process of goods ordering the Buyer can go back to the individual steps to check and correct possible errors in his order. 7. The Buyer places the order for the goods by order confirmation by clicking the "send" link agreeing to the Terms by sending the order. Until the Buyer ends the ordering process by clicking on "send" link and the order becomes confirmed, the Buyer can at any point of ordering the goods cancel the goods ordering in a way that he interrupts the execution of individual steps leading to goods ordering as described above, and leaves the Website for the goods ordering. 8. After sending the order confirmation of the goods, the Buyer receives at his e-mail address provided at the time of registration of the user account or within a single order, the order confirmation stating, among others, the order number and a summary of the Purchase Contract, including a reference to the Terms. By delivering an order confirmation in accordance with the preceding sentence the Purchase Contract is concluded and a contractual relationship between the Seller and the Buyer is established. 9. In connection with ordering the goods the Seller may contact the Buyer by e-mail on the Buyer's e-mail contact provided by the Buyer at the time of registration or within a single order, respectively by telephone at the phone number indicated by the Buyer at the time of registration or within a single order, in matters related to the fulfilment of the Purchase Contract. The Seller is always entitled, depending on the nature of the order (quantity of goods, purchase price, estimated shipping costs, etc. ), to ask the Buyer for additional order confirmation in a way as stated above. 10. The Purchase Contract can be concluded only in English language. 11. The Purchase Contract is concluded via e-shop, thus using the means of distance communication - the cost of means of distance communication is not different from the basic rate, while these costs are born by the Buyer (in case of the internet and dial-up connections according to the terms of the connection provider, the Seller in this context does not charge any additional fees). The Buyer agrees to use the means of distance communication when concluding the Purchase Contract. 12. The Buyer's order is after its confirmation as a Purchase Contract concluded between the Buyer and the Seller archived electronically to be fulfilled and recorded further. 1. The purchase prices of goods and services in e-shop include VAT, including all fees stated by the law, however, the costs of delivering the goods vary according to the selected mean of delivery and payment of the purchase price. 2. The purchase price indicated for the goods at the time of execution of the order is binding both for the Seller and the Buyer, and after placing the order it shall not be changed, even if the Seller adjusts the purchase price of the goods, or there is a discount promotion. The Seller is not limited by this provision to conclude a Purchase Contract under conditions negotiated individually. 3. The Seller reserves the right to change the purchase price for the goods offered for sale via e-shop and to organize the discount promotions, all in accordance with applicable law. Any discounts of the goods price provided the Buyer cannot be combined unless the Seller decides differently under the provision of discount promotion. 1. Payment of the purchase price is made in €. - card payment system (online card payment, through the payment system of the listed banks, GoPay account). 3. If the Buyer selects the method of payment by bank transfer to the Seller's bank account, the purchase price is due within 7 days from the day of conclusion of the Purchase Contract, and that to the Seller's account stated above. The Buyer is obliged to pay the purchase price of the goods and to indicate the variable symbol of the payment, which shall be listed in the order confirmation or the information shall be provided by the Seller without undue delay after the conclusion of the contract; if the Seller does not do so explicitly, the Buyer's order number is the variable symbol of the payment. 4. If the Buyer selects the card payment method through the payment system, after the completion of the orders confirmation he shall be redirected to the Websites of service providers, through which he shall make a payment of the purchase price, which is due on the day of conclusion of the contract. In order to make the payment of the purchase price using the payment system, the Buyer must have a valid credit card allowing the transfer of funds within such systems. 5. The selected payment method of the purchase price can be changed after execution of the order only with the consent of the Seller. 6. In case of bank transfer the obligation of the Buyer to pay the purchase price is fulfilled at the moment, when the appropriate amount is credited to the Seller's account. 7. The Buyer acquires the property rights of the goods by paying the entire purchase price of the goods. 8. When concluding the Purchase Contract the Buyer expressly agrees that the invoice for the goods purchased shall be provided exclusively in electronic form (electronic invoice), the electronic invoice shall be issued by the Seller after payment of the purchase price of the goods in full and it shall be sent to the Buyer by e-mail at Buyer's e-mail contact indicated by the Buyer at the moment of registration or within a single order. 9. The Seller does not require the Buyer to pay a deposit or other similar payment, however, in serious cases (especially in the absence of the Buyer's additional order confirmation pursuant to Art. III., par. 9 of the Terms) the Seller is entitled to require the Buyer to pay the purchase price in full before sending the goods to the Buyer, even if the Buyer has selected the payment method of the purchase price as cash on delivery..
1. The goods are delivered by the Seller exclusively within the territory of the Europe. 2. If according to the Purchase Contract the Seller is obliged to deliver the goods to a place specified by the Buyer in the purchase order, the Buyer is obliged to accept the goods on delivery at this place. If for the reasons of Buyer the goods need to be delivered repeatedly or by any other mean of transport than stated in the order, the Buyer is obliged to pay the Seller the costs associated with repeated delivery of goods, respectively the costs associated with other delivery method. 4. If based on the Buyer's request an individual negotiation of a particular method of delivery of the goods takes place, the Buyer bears the risk and additional costs associated with such method of delivery of the goods. 5. If the goods are in stock, the Seller sends the goods to the Buyer within 2-5 working days from the date of conclusion of the Purchase Contract. If the Buyer selected to pay via the bank transfer to the Seller's account, or he selected the cash payment through any payment system, the goods that are in stock are dispatched within 2-5 working days from the date, when the payment of the purchase price is credited to the Seller's account. Unless the goods ordered by the Buyer are in stock, and unless such information is obvious to the Buyer already when ordering goods (with particular reference clauses availability "on request" or "not in stock" in the presentation of goods in e-shop), the Seller informs the Buyer of this fact without undue delay by e-mail at Buyer's e-mail contact indicated by the Buyer at the moment of registration or within a single order, respectively by telephone at the telephone number indicated by the Buyer at the moment of registration or within a single order. 7. The Buyer is obliged to pay to the Seller the costs of delivery together with the purchase price of the goods. Unless expressly stated otherwise, under the Terms the purchase price includes the costs of delivery. 8. By receipt of the goods from the carrier the Buyer is obliged to check the integrity of the packaging of goods and in case of any defects to notify the carrier immediately. The Seller is not liable to the Buyer if the Buyer breaches this obligation. 1. The Seller is entitled to withdraw from the contract concluded with the Buyer if the ordered goods are no longer produced or delivered, as well as in case of evident error in the goods price (i.e. price obviously other than the usual price for this type/kind of goods). 2. The Seller is also entitled to withdraw from the contract if the Buyer fails to make the bank transfer to the Seller's bank account within 7 (seven) days from the day of conclusion of the Purchase Contract and/or when the Buyer fails to make the card payment through the selected payment system by the end of the day of conclusion of the Purchase Contract. 3. The Buyer may at any time, from the time when the Purchase Contract was concluded to the point when the goods were dispatched by the Seller, ask the Seller to cancel the Purchase Contract. The Purchase Contract shall be terminated by agreement of the Contractual Parties if the Seller notifies the Buyer his acceptance of the proposal to cancel the Purchase Contract. 4. When a gift is provided to the Buyer together with the goods, the deed of gift between the Buyer and the Seller is concluded with a cancellation clause stating that in case of withdrawal from the Purchase Contract by the Buyer (Art. VII of the Terms, Art. VIII of the Terms) the deed of gift shall cease to have effect regarding such a gift, and the Buyer is obliged to return the goods to the Seller together with the gift. 1. In accordance with Art. 1829 of the Civil Code, the Consumer has the right to withdraw from the contract without giving any reason within 14 days from receipt of the goods, resp. from receipt of the final delivery of the goods, if the subject matter of purchase are multiple goods or the goods consisting of several parts. - No later than 14 days after receipt of the goods the Seller must be sent the Buyer's manifestation of will to withdraw from the contract. - For withdrawal from the contract the Buyer can use the withdrawal form available here. The completed withdrawal form can be sent to the Seller via e-mail; in this case the Seller confirms the receipt of the form to the Buyer in writing without undue delay, otherwise the Buyer is allowed to print the form and send it completed at the Seller's correspondence address. - The Buyer is obliged to send the goods to the Seller at the Seller's correspondence address or the address of his registered office without undue delay but not later than 14 days from the withdrawal from the contract. In accordance with Art. 1820 par. 1 point. g) and Art.1832 par. 3 of the Civil Code, the Buyer bears the costs of returning the goods upon withdrawal from the contract, even if the goods cannot be returned in usual postal way due to their character. The returned goods should not show the signs of use, should be undamaged and complete (including accessories). The Buyer is responsible to the Seller for the diminished value of the goods arisen as a result of disposal of the goods other than necessary with respect to their nature and properties. 3. Following the withdrawal from the contract by the Buyer, the Seller without undue delay but not later than 14 days from the withdrawal from the contract returns to the Buyer all funds, including the costs of delivery of adequate cheapest method of delivery of the goods offered by the Seller. However, the Seller is not obliged to return the funds received to the Buyer before the Buyer hands over the goods to the Seller or prove that the goods were dispatched to the Seller. 4. According to the provision of Art. 1832 par. 1 of the Civil Code the Buyer agrees the Seller returns the funds received by bank transfer to Buyer’s bank account stated by the Buyer in the withdrawal from the contract, or communicated to the Seller in connection with the withdrawal from the contract. Only when such process of refund is not possible, the Buyer returns the funds by postal order to the Buyer's address provided at the moment of registration or within a single order. 5. The Buyer acknowledges that pursuant to Art. 1837 of the Civil Code, it's not possible, among others, to withdraw from the Purchase Contract for the supply of goods that have been adjusted on request of the Buyer or for his person, from the Purchase Contract for the supply of perishable goods, as well as the goods that have been mixed irrevocably with other goods after delivery, from the Purchase Contract for the supply of sealed goods that the Consumer unsealed and they cannot be returned for hygienic reasons, and from the Purchase Contract for the supply of audio or video recordings or computer program if the Buyer damaged their original packaging. 6. The Seller is entitled to unilaterally offset his claim for compensation for the damage to the goods from the Buyer's claim for refund of the purchase price. 1. The rights and obligations of the Contracting Parties regarding the rights of defective performance are governed by the relevant general binding legislation (including the provisions of Art. 1914 to 1925, Art. 2099 to 2117 and Art. 2161 to 2174 of the Civil Code). 2. Buyer's right of defective performance is established by a defect that object has when the risk of damage passes to the Buyer, though not manifested until later. Buyer's right shall also be established by a later occurred defect the Seller caused by the breach of his obligations. 3. The Buyer doesn't have the right of defective performance if it is a defect he had to recognize with usual attention already at the moment of concluding the contract. This does not apply if the Seller assured him explicitly that the object is without defects or if the Seller obscured the defect slyly. 4. If defective performance represents a material breach of the Purchase Contract, the Buyer has the right to defect removal through delivery of new objects without defect or delivery of missing object, the right to defect removal through object repair, the right to a reasonable discount on the purchase price or the right to withdrawal from the Purchase Contract. The Buyer shall notify the Seller about the chosen right when notifying defects or without undue delay after notification of the defect; the Buyer's option selected may not be changed without the consent of the Seller. If the Buyer does not choose his right in due time, he holds the rights under the following provision. 5. If defective performance represents immaterial breach of the Purchase Contract, the Buyer has the right to remove defects or to a reasonable discount on the purchase price. Until the Buyer exercises his right to discount on the purchase price or withdraws from the Purchase Contract, the Seller can deliver what is missing or remove the legal defect. Other defects may be removed by the Seller upon his choice through object repair or delivery of a new object; the choice must not cause the Buyer any unreasonable costs. 6. The Buyer cannot withdraw from the Purchase Contract or request delivery of new object if he is unable to return the object in the state, in which it was received. This does not apply if there has been a change in state as a result of inspection to detect the defects and/or if the Buyer used the object before discovering defect, and/or if the Buyer did not cause the impossibility of object return in unchanged state by acting or failure, and/or if the Buyer sold the object before discovering the defect, if he consumed it or changed the object in normal use; if it happened so only partially, the Buyer shall return the Seller everything that can be returned and shall provide the refund up to amount, at which the Seller benefited from the use of the object. 7. If on the object being sold, on its packaging, in the instructions attached to object or in advertising, in accordance with other laws there is specified the period, during which the object may be used for the usual purpose, the Seller provides the quality warranty to the Buyer in this range. The warranty period runs from submitting the object to the Buyer; if the object was dispatched under the contract, the warranty period runs from the day the object reached its destination. 8. The Buyer has no right under the warranty if the defect was caused after the transfer of risk of damage to the Buyer by the external event. This does not apply if the defect was caused by the Seller. 9. Rights of defects are exercised to the Seller at the place of his establishment, or a notice of exercising the right of defects including the claimed goods can be sent to the address of Seller's registered office. If the Buyer exercises the right of defective performance, the Seller confirms in writing when the right was exercised, as well as the repair and its duration. 10. If you claim the products due to an allergic reaction, it is necessary to add to the claimed goods also a medical report, whose assessment is essential for the recognition of the warranty claim. 2. If the defect occurs within six months from receipt, it is considered that the object was defective at the time of receipt. if it is clear from the nature of the object. 4. If the object does not show the properties as stated above in the par. 1 of the provision of the Terms, the Buyer may require the supply of new object without defects, unless it is in view of the nature of the defect unreasonable, but if the defect concerns only a component of the object, the Buyer may require a replacement of the component only; if it is not possible, the Buyer may withdraw from the contract. If, however, in view of the nature of the defect it is disproportionate, especially if the defect can be remedied without undue delay, the Buyer is entitled to a free remedy. 5. The Buyer has the right to delivery of the new object, or replacement of the component in case of removable defect if the object cannot be properly used for recurring defect after the repair or for a larger number of defects. In such case the Buyer has the right to withdraw from the contract. 6. Unless the Buyer withdraws from the contract or exercises the right to delivery of the new object without defects, the right to replacement of its component or the right to repair the object, he may request a reasonable discount. The Buyer has the right to an adequate discount even if the Seller is not able to deliver to the Buyer a new object without defects, to replace its component or to repair the object, as well as if the Seller fails to remedy within a reasonable time, or if it was considerably difficult for the Buyer to remedy. 1. The Seller or the authorized person shall decide on the warranty claim immediately, in complicated cases within three working days. This period does not include an adequate time depending on the type of product or service required for expert assessment of the defect. Warranty claim, including remedy of the defect must be handled without undue delay, within 30 days from the day of filing the warranty claim, unless the Seller and the Consumer agrees on a longer period. After this period the Consumer has the same rights as if defect that cannot be remedied. 2. The Seller is obliged to provide the Consumer a written confirmation stating when the Consumer exercises the right, what is the subject matter of the warranty claim and what method of warranty claim handling the Consumer requests; and further confirmation of the date and method of handling the warranty claim, including confirmation of repair and its duration, or a written justification for rejecting the warranty claim. 3. In accordance with Art. 1820 par. 1 point. j) of the Civil Code the Seller notifies that with regard to the extrajudicial complaints the Consumer may contact the supervisory authority, which is the Czech Trade Inspection, ID: 000 20 869, registered office at Štěpánská 567/15, 120 00 Praha 2, www.coi.cz . Czech Trade Inspection handles the Consumer complaints in a manner and under conditions determined by the applicable law. 1. Based on the Buyer's registration in the e-shop, the Buyer can access his user account and make the goods orders from his user account. Registration further allows the Buyer to view the order history, the current status of order processing and after the creation of a user account also a simplified implementation of new orders (the system automatically registers the Buyer and delivery information). 2. The registration form shall appear after the Buyer clicks on the "registration" link and the entry form shall appear after the Buyer clicks on the "login" link. 3. During registration in the e-shop and goods ordering the Buyer undertakes to provide correct and truthful information; at the same time the Buyer undertakes to update any amendments to information indicated in the user account. The information indicated by the Buyer in the user account is considered by the Seller to be complete and correct and the Seller is not responsible for its incompleteness and/or inaccuracy. 4. Access to the user account is secured by user name and password. The Buyer is obliged to maintain confidentiality regarding information necessary to access his user account. The Buyer is not entitled to allow the use of a user account to third parties. 5. The Buyer acknowledges that the user account may not be continuously available, especially with regard to the necessary maintenance of Seller's hardware and software, resp. necessary maintenance of hardware and software of third parties. 1. By concluding the Purchase Contract the Buyer grants the Seller consent to the processing of personal data under the following conditions. 3. The above stated personal data shall be processed for the following purposes: offering business and services, marketing and advertising activities, sending newsletters, wholesale/retail - creating client database (customers), management of user account, as well as fulfilment of Purchase Contracts concluded, all in connection with the operation of the e-shop. 4. Personal data is stored in a secure database. Personal data shall be processed manually (by Seller’s employees and processors) and automated (by Seller’s employees and processors). 5. Consent to the processing of personal data is granted for an indefinite period. The Buyer is entitled to cancel consent to the processing of personal data at any time by notice sent electronically to the Seller's e-mail address or in writing to the Seller's correspondence address. 6. The Seller may appoint a third party as a processor to process the personal data of the Buyer. Except for the persons transporting goods, personal data shall not be passed on by the Seller to the third parties without the prior consent of the Buyer. 7. The Buyer has the right to access personal data, has the right to correct and to complete the data, has the right to its blocking, is allowed to ask the Seller to explain and remove the defective state in the event that the Buyer thought the Seller or processor performs the processing of personal data of the Buyer, which contradicts with the protection of private and personal life of the Buyer or contradicts the law, especially if the personal data is inaccurate for the purpose of processing, and always through application sent electronically to the Seller's e-mail address or by writing to the Seller's correspondence address, or to the Seller's registered office. The Buyer shall be informed about the subsequent procedure in writing or by e-mail. 8. If the Buyer requests information regarding the processing of his personal data, the Seller is obliged to provide the information to the Buyer. For providing the information pursuant to the preceding sentence the Seller has the right to require reasonable compensation not exceeding the costs necessary for providing the information. 9. In the Purchase Contract the Buyer expresses his consent to receive Seller's newsletters related to Seller’s similar products or services to the electronic address the Buyer provided at the moment of the registration of a user account or within the single order, and to this extent and for this purpose the Buyer grants consent to the processing of his personal data. The Buyer may at any time refuse receiving commercial information by a notice to the Seller's e-mail address. 10. The Buyer confirms the personal information provided is complete and correct and he was advised providing personal information is voluntary. 11. The Buyer agrees with the storage of so-called "cookies" on his end device (e.g. computer) so as to facilitate the provision of information society services; the Buyer has the right to refuse "cookies" or similar device are stored on his end devices, e.g. by running private browsing functionality in his browser. 1. Derogation provisions stated in the Purchase Contract prevail over these General Terms and Conditions. 2. The Seller is entitled to amend or complete the wording of the Terms and Conditions, whereby such provision shall not affect the rights and obligations of the Contractual Parties of the Purchase Contract concluded during the effective period of the previous wording of General Terms and Conditions. 3. In relation to the Buyer, the Seller is not bound by any Codes of Conduct in accordance with the provision of Art. 1826 par. 1 point e) of the Civil Code. 4. The Buyer assumes risk of a change in circumstances in accordance with the provision of Art. 1765 par. 2 of the Civil Code. 5. The Seller is entitled to sell the goods based on the relevant business license. Trade inspection is carried out by the authorized Trades Licensing Office. Supervision over protection of personal data is exercised by the Personal Data Protection Authority. Czech Trade Inspectorate exercises within the specified range, among others, the supervision over compliance with Act no. 634/1992 Coll., On consumer protection, as amended. 6. The Buyer hereby agrees with delivery service to the Buyer's e-mail address indicated by the Buyer at the moment of registration or within a single order. 7. If the contractual relationship established by the Purchase Contract includes an international (foreign) element, then the Contractual Parties agree that the Purchase Contract and the contractual relationship of the Purchase Contract are governed by the Czech law. This does not affect the Consumer's rights arising from generally binding legislation. 8. If any provision of the Terms and Conditions is invalid or ineffective, or it becomes so, a provision whose meaning is the closest to the invalid provision shall enter instead of the invalid provisions. The invalidity or ineffectiveness of one provision is without prejudice to the other provisions. This is a unique balm made from cannabis and 25 herbs. 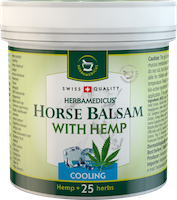 Horse balsam with cannabis is made according to a traditional Swiss recipe. 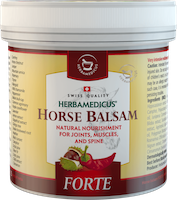 It contains also the fruit and flowers of horse chestnut, which have been proven to be effective against varicose veins. This is a unique balm made from cannabis and 25 herbs. Horse balsam with cannabis is made according to a traditional Swiss recipe. 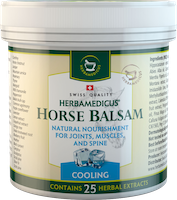 It contains the fruit and flowers of horse chestnut, which have been proven to be effective against varicose veins.